Many told me that my prediction about Argentina wrong, because the Netherlands is a formidable opponent for Argentina. The reason they are about it because the match between Argentina with Belgian won 1-0, even they say Argentina win countless victories fate. However, it does not discourage me to continue to support Argentina advanced to the 2014 World Cup Final, because I have a principle that the ball is round and who would have thought precisely 06.00 pm July 10, 2014 is history for Argentina to advance to the finals in the cup match world in 2014 against the Netherlands won the shootout Finalty. If I predict Argentina to advance to the final round, then the prediction is very unfortunate if I had to stop at the final chance alone, because as I said before, "the ball is round". We have to admit that German players have a tough and fast attack system, however Argentina not be underestimated even though opponents they will face really tough. Surely all the strategy and learn from the way the German attack and beat Brazil to 7-1 are the steps taken to monitor the Argentina coach blemish or wrinkle German weakness. Therefore, my prediction for the winner of the World Cup is Argentina. 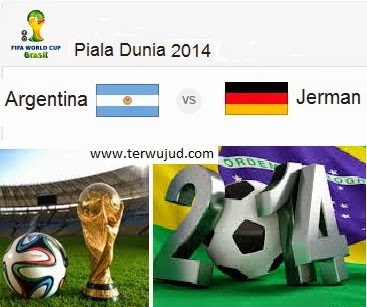 Many friends who said that Brazil could be defeated Germany with a score of 7-1, then to 8-0 Argentina, heard it I immediately said "we'll see about that on Monday, July 14, 2014". For my friends who supports German, please write it down. For the support of Argentina like me, then feel free also to write through the comment section.